Magic Leap has promised it’ll start shipping its mixed-reality headset by the end of the summer, and it’s going to need developers to get cranking on content. New additions to developer guide show us what its operating system will look like. The verdict: It looks pretty nice. With Magic Leap’s years of lofty promises and underwhelming delivery, it’s small praise to say that its operating system looks nice—but major products like the Apple TV and the Xbox One have notoriously found a way to botch such an essential part of the product. Magic Leap has bold icons, clear usability, and lots of uncluttered space in its UI. 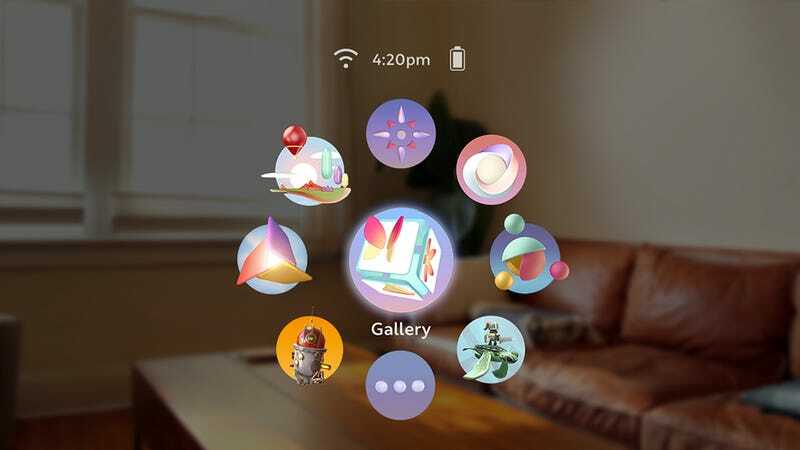 The home screen shows off some unfamiliar icons that could be proprietary apps, and the guide lays out tons of best practices that will eventually form the Magic Leap aesthetic as developers decide to follow or ignore them. Usability topics like “create simple ways forward and back,” “Indicate active objects,” and “make actions clear,” sound obvious, but it’s important that devs keep them all in mind if the grand Magic Leap plan of creating a whole new approach to computing is ever going to work. The system menu example also shows you one of the many gesture controls that are similar to what Microsoft is doing with its mixed-reality devices. Design and branding will be pretty important for Magic Leap to set itself apart—at this point, its primary distinction from Microsoft is the fact that a lot of people still think it’s vaporware. Again, the real test is going to be how it feels to go from one mode to another and whether prolonged use makes you want to puke your guts out. We like what we’re seeing, though. I’ve dumped some more images in the slideshow below, and if you want to read through the developer documents, you can set up a login here.